Jenny is the Associate Director of the Aspen Network of Development Entrepreneurs (ANDE), a global network of innovative organizatons that propel entrepreneurship in emerging markets. The network’s members provide critical financing and business support services to small and growing businesses (SGBs) that create significant economic, environmental and social impacts in developing countries. ANDE’s 140 plus members have operations in 150 emerging market countries. Jenny has twelve years experience in the private and non-profit sectors. Most recently, she was the Senior Program Manager, Membership and Individual Donors at Hispanics in Philanthropy. She has also worked with DoubleClick in San Francisco and the Concha y Toro winery in Santiago, Chile. During business school, she worked with Agora Partnerships in Nicaragua, Enterprise Solutions for Poverty in New York, and Investors’ Circle in San Francisco. She is a former member of the Advisory Council of the New and the Board of Refugee Transitions in San Francisco. 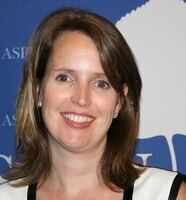 She has an MBA from the NYU Stern School of Business and a BA in Latin American Studies from Davidson College. Over the coming year, the Aspen Network of Development Entrepreneurs will work with several partners (including Village Capital, Emory University, I-DEV and Halloran Philanthropies) to expand on what New Ventures and many others have begun—and ultimately accelerate the accelerators. To do this, we are looking at pipelines, operations, and evaluation. To begin to address the need for more local collaboration, we started to pilot Regional Chapters in early 2010 by asking members where they should be – and encouraging them to work with us to design and launch chapters in regions where there were high concentrations of ANDE members who wanted to work together in a more intentional way. This led to the launch of chapters in Brazil, Central America/Mexico, East Africa and South Africa in 2010, followed by India in 2011. We have recently increased our team to include four new global team members. Next in our video series, the FOUND Middle, we introduce Ueli Frei, executive director of FUNDES. Frei discusses the organization’s work helping large corporations organize their suppliers and distributors and facilitating sourcing from small businesses. One of the biggest challenges the sector still faces is connecting entrepreneurs with the right type of capital at the right time. As ANDE evolves we have come to find that the missing middle itself has a missing part—because even in our network of members, very few are able to provide financing at the critical $25,000 - $200,000 range. Guillermo Rivero, managing partner with Root Change, a capacity development provider that works in Africa, Asia and Latin America, discusses the importance of technical assistance to help businesses succeed. He also stresses the need to bring in outside input and ideas to help an organization evolve. Next in our video series we introduce you to Richard Roque, managing director of SA Capital Limited, a Hong Kong private investment company focused on triple bottom line impact investments. In this interview he discusses how SA Capital seeks to identify and invest in social businesses in China. In honor of Global Entrepreneurship Week, we share with you the next video in our continuing series, which features Nneka Okekearu, Centre Manager for the Enterprise Development Center (EDC) at the Pan African University in Nigeria. EDC focuses on the business development and provision of support services to small and growing businesses in Nigeria. As part the "FOUND Middle" series, we share this interview with Kanmani Arumugasamy of Arogyam Organics Pvt. Ltd. Based in India, Arogyam works to promote organic products and improve the quality of life of local farmers by reducing middle man costs. This video is one of many highlighting businesses and organizations making up the "missing middle."